Used for jokes and tricks. It unrolls itself under a light load. A grief knot is a binding knot which combines the features of a granny knot and a thief knot, producing a result which is not generally useful for working purposes. Its name is an example of a portmanteau. 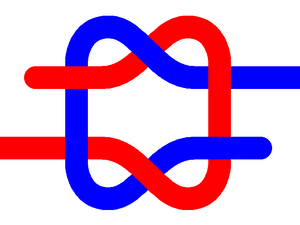 The grief knot resembles the granny knot, but tied in trans form (as opposed to cis form). This means that the working ends come out diagonally from each other, whereas a Granny's ends both come out on the same side. It unravels rather elegantly: as tension is applied, the ropes rotate like little cogs, each one twisting to feed the rope through the knot. To tie the grief knot, create a bight in the end of a rope, with the standing part on the left and the free end on top. Then take the other end, and pass it up through the bight, over the top of the bight, down and up through the bight again to go over the bottom of the bight, and then finally up through the bight to come out where the end first went in. The second end has thus taken an anticlockwise tour of the bight, going alternately under and over every line it encounters. This page was last edited on 8 July 2013, at 09:13.